We weren't all mothers, we weren't all entrepreneurs, we didn't dress or look alike, but we all heard it: "There is no such thing as work life balance, there are just priorities." "Who Works Harder: Working Moms or Stay at Home Moms?" "Most Americans Say Kids are Better off with Stay At Home Moms"
"Are You Leaning In Enough?" "Top Five Regrets of the Dying"
About a month ago, I found myself uncomfortably tied in knots from wondering if I'd deprived the girls of something by working as soon as I did, or if I'd given up opportunities at work by telecommuting or, if in the end, I'd simply done it all wrong. My heart was heavy with conflict and a kind of low-grade hopelessness. I'm not interested in Cross Fit, not committed to eating clean and honestly, the mechanics of networking make me cringe, which leaves this space that feels listless, neither completely satisfied by what I'm doing, nor swept up in a movement that gives me any measure of hope. I clung to the love of my family, but quietly longed for the fire of purpose that would help me break through the fog. I was sitting at my desk when the chime of a new email arriving sounded. It was an invitation to an event called, "The Third Metric: Redefining Success Beyond Money & Power." I began reading the description, literally gasping as I read that it would be held at the home of Arianna Huffington. My hands shook as I continued reading. The list of speakers was staggering -- John Mackey, CEO of Whole Foods; Katie Couric; Leslie Stahl; George Stephanopoulos; Valerie Jarrett; Angie Hicks, Founder of Angie's List... it just went on and on. I found myself scrolling to the bottom for a cost, clause, or something else that would explain how it got to my inbox and why I didn't really qualify. Shaking my head with chagrin, I thought about how even though I am the boss, I don't always make that choice. I feel like I can't. I remembered how just a few weeks earlier, I'd nervously marked a day on the calendar as unavailable so that I could attend a class field trip. These decisions are not without consequences, but neither are their opposites. We choose what to put first when and we don't get second chances so much as we can carry the memory with us to inform future decisions. Eight years ago, I started my plan B when I left one job where I had to furtively pump milk in a unisex bathroom and stop when someone would pound to come in, then face the walk of shame to my desk and cooler, where I stored the milk. I was not welcome in my capacity as a new mom committed to pumping. Be here, now, as what we want. We don't want to see this side of you. Leaving and working for someone who let me close my office door to pump was my first taste that it could be different. The people around me were scribbling furiously. Collectively, we wanted to be a part of the picture that was being presented. It was not saying to forsake money, it was not denying the value of success; at its core, it was that our happiness and our well-being are a component of the Third Metric. Does it sound new-agey to think about weighing how people support your happiness as a part of success? Or does it really just start to make a whole heck of a lot of sense? This one hurt. I watched so many heads nodding, even men. All the times I'd thought, Look at how much I am accomplishing were not so black-and-white. I do accomplish a lot, but at the end of the day, did typing an email through a phone call do anything more than make me miss nuances in the conversation and hit send with the word "and" spelled "adn?" My cheeks burned as I remembered a time I had been at the gym with Sean. We were on the treadmill, I think, and he said, "You can't control your heartrate, you know?" I'd been trying to not get winded because some part of me still seems to think that there really is an attainable perfection, a no-breakout, no embarrassing line-flub, no short fuse or irritability me that I can sustain. I actually nodded as I tweeted, "Imagine what we'd move/build if we quit carrying perfection guilt." This is where things took a turn for me. The message began to shift. Sitting in my seat, these famous and accomplished people started talking not about pedigree, not about technical tools or even circles of support; they talked about love, restorative time and the power of food and thought to influence health, but mostly, they talked about deciding to steer your own life. The more I listened, the more I understood that every man/woman/mom struggles with the simple idea of taking time to enjoy something.The secret to overcoming the fight is finally having the idea delivered in a way that we can embrace with ferver and without shame. Laughter, nodding, more writing. We began to move toward the stage emotionally, craning to get closer to the message. She raised her hand as if to say guilty as charged. Another session had Arianna asking George Stephanoopoulos about meditation: "I have been doing it for more than two years and I haven't missed a day... I feel more space in my life, a cushion." He wasn't the first or the last to talk about meditation, which for me, can seem so easy to discount, but these were people who ran the gamut, from young to older, from health fields to finance. They told us you just need twenty minutes twice a day and it doesn't have to involve a single om. Katie Couric, who was moderating the panel, raised her hand and basically asked if there was a way to do it in less time. "I don't really have that much time a day for this." Then a person in the audience raised their hand to ask a question, "So, can we all agree that if someone of Katie's stature and success can't find 20 minutes a day for meditation, then the rest of us can't? And that we actually have a problem?" Katie laughed and defended herself saying, "Actually, it's 40 minutes," but the point was made. Everyone struggles, everyone thinks that they can't make the time, but in the end, is it really impossible to find two twenty-minute blocks to make yourself better? More productive? That really is it. How do we shift from the saying that we will to actually doing it? And what is it? For me, sitting in the inexplicably beautiful surroundings of this New York City home, watching Leslie Stahl and Barbara Walters gab like school girls, confident in taking the time for this experience, I began to get it. Hearing the repetition of the need to create boundaries. Then Arianna told a story of trying to get her staff not to sleep with their iPhones. "You need to separate. I went to Pottery Barn and bought each of them a vintage-looking alarm clock for $34. There, now you have no excuse." Oh, the excuses. We all come up with them. We were all incredibly charged up at this point, puffed up with the possibility. 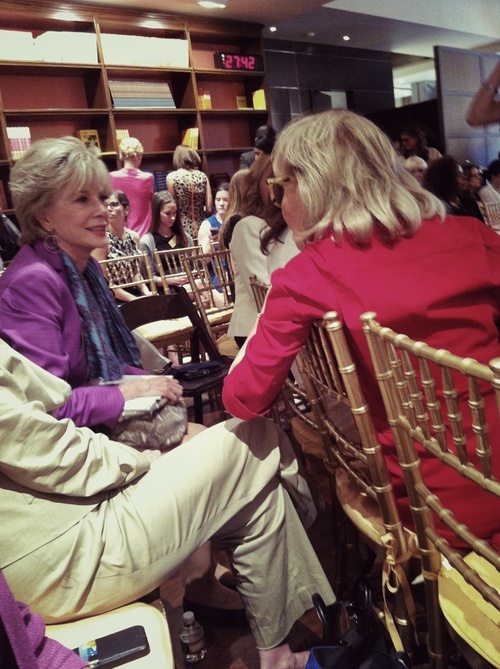 Candice Bergen was asked how far we've come since Murphy Brown. "It has changed, but certainly not as much as we might have wanted," she said. Silence. "Lena Dunham is doing things, but she's the only one." Suddenly, I felt the fiery purpose I'd been seeking. I was here because I really can make a difference, and I can start by changing how I defer my life choices. Rebecca Miller said, "Five percent of directors are women... we aren't mentoring. We have to decide to help a woman get somewhere. We have to engage in a kind of sponsorship." Then another panelist said: "We do have power and influence. We should use it not just for ourselves. We should use it for our sons and our daughters." I own a business, I have three daughters. I have purchasing power and a platform. 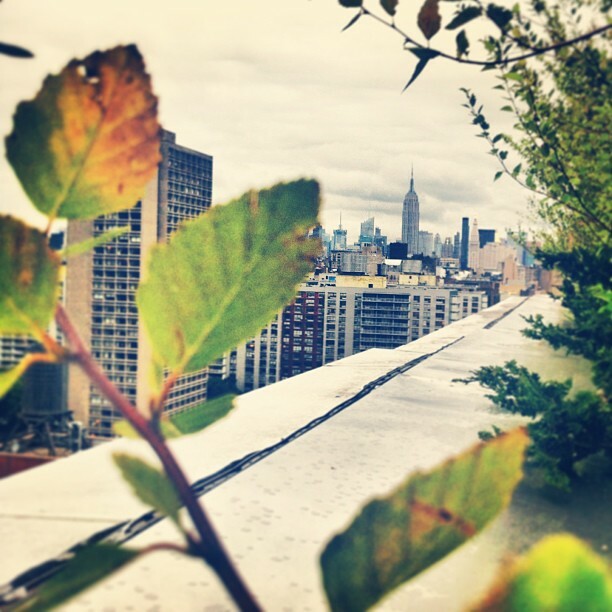 I want to be a part of building a new reality where we include health in our equation of success, creating a legacy, not in money that gets passed on, but in a trail cut through the hurdles and obstacles that come with life, that skirts along places of beauty. Satisfaction from having given time, heart, creativity and more to an organization. I want my daughters and other young women to see invitations and not think, I don't belong on this list, but to instead feel worthy and proud. My business can be a place where I don't live with the white knuckles of aging out of cool. I can work with a new string; younger, prettier, hungrier. "The millennials will create the conscious businesses that will change our world," explained John Mackey as he talked about writing a book for them. Desiree Gruber spoke to considering staff as entrepreneurial employees, "Here's what we'd like you to do. Doing it will provide you with skills that will serve you for whole life." The reason it works, the reason the Third Metric resonates, is that it isn't do this and get this or eat that and feel this, the reason the fire of the Third Metric has stayed stoked within me is that is gives me believable, practicable and actionable things to do to change my world. I can change how and when I do things. I can choose to work more or less, go on more field trips or carve time for more adventures. 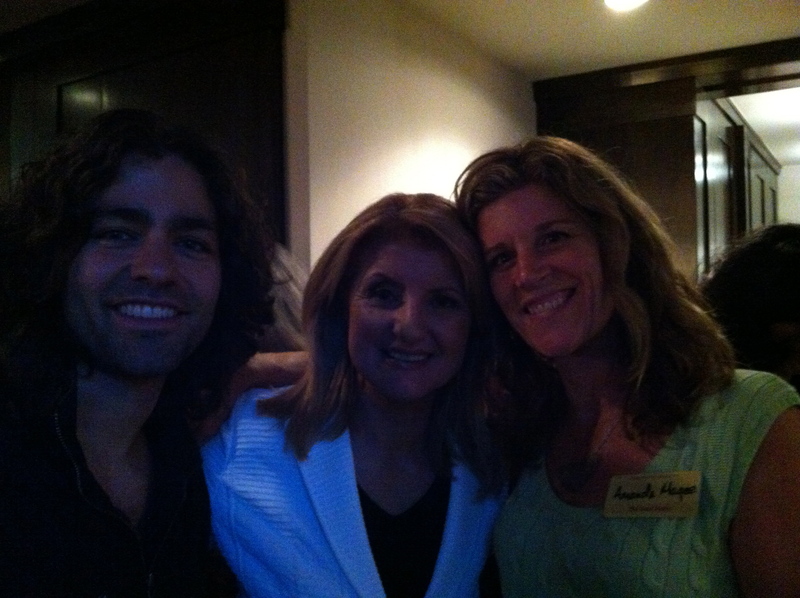 I can approach Arianna Huffington and thank her for creating this event that sparked an emotion. I no longer feel alone and yet, maybe for the first time, I really feel like I alone, can make the decisions that will allow me to enjoy the true measurement and fulfillment of the Third Metric.